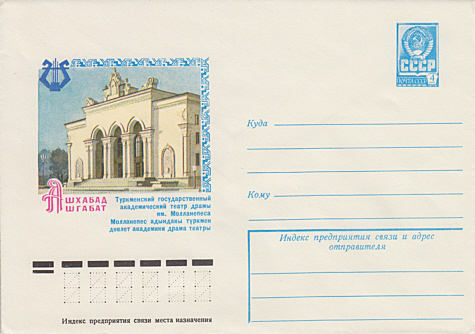 Opened 1941 as "Turkmensky teatr dramy im. Mollanepesa", named in honour of the Turkmen writer, Mollanepes (1810-1862). 1956 renamed "Dramatichesky teatr im. Makhtumkuli" in honour of the Turkmen 18th century poet, Mahtum Quli (Magtim Guli). 2006 the company moved to a new building. Old building subsequently used as student theatre "Mollanepes". 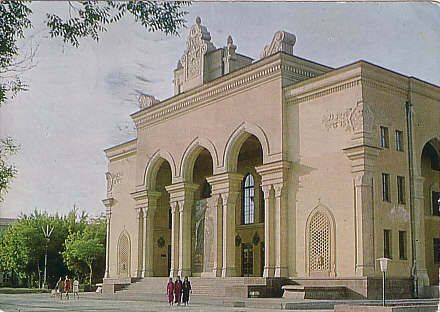 Front Text: "Ashkhabad, Turkmensky gosudarstvenny akademichesky teatr dramy im. 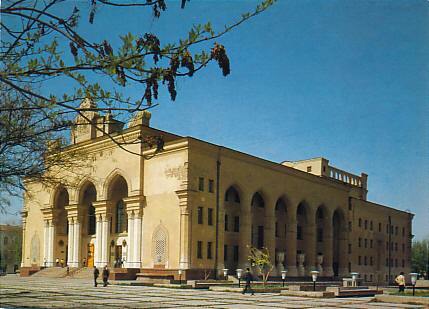 Mollapenesa; Ashgabat, Mollapenes adyndaky turkmen doblet akademiki drama teatry"
Reverse Text: "Ashgabat, Turkmensky gosudarstvenny akademitchesky teatr dramy im. Mollanepesa"
Reverse Text: "Ashgabat, Dramatichesky teatr im. Makhtumkuli - The Makhtumkuli Drama Theatre in Ashkhabad"